With a heat wave raging outside, Baltimore native and Cirque du Soleil Crystal cast member, Scott Smith stopped by the Mt. Pleasant Ice Rink on Tuesday to lead a cool clinic for the Baltimore Figure Skating Club’s intermediate skaters. “It’s great to be back. I haven’t been back here in twenty years, but just walking in, I remembered the smell of the rink and the way the ice felt,” Smith says. Smith discovered his love for the sport as a child at a birthday party at Mount Washington’s Northwest Ice Rink, which has since been closed. He joined skating programs there and eventually signed up for private lessons. “I just kept getting more and more involved. Skating slowly took over my life,” he says. After 8th grade, Smith moved to Delaware and participated in the University of Delaware Skating Club. He had a brief competitive skating career and then became a professional skater. “After my competitive career, I switched over to shows and started performing on cruise ships, which I did for seven years, until joining this show last November” Smith says. At the Mt. 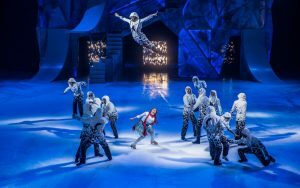 Pleasant Ice Rink, Smith and co-performer Shawn Sawyer gave skaters of a taste of what to expect from the Cirque du Soleil show, the first ever on ice, with a special performance of their routine. Dressed in geometric outfits and cartoon makeup, Smith and Sawyer leapt and soared across the ice using fun dance moves and quick skating tricks. After the sneak preview, Smith and Sawyer gathered the skaters in the middle of the rink for a clinic. 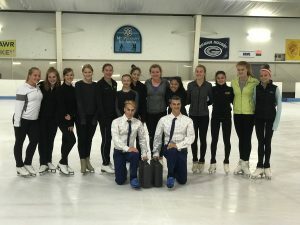 The skaters learned one dance from the show, along with special tips for complicated tricks and moves.